It’s a subtle sleight of-hand that draws on things we all know — lots of decent working-class jobs have left the country or been automated out of existence. The twist is that he acts like this is true of all low- to middle-skilled jobs. Factories are increasingly automated, iPhones are made in China, a table-side console could replace waiters, and, voilà, the only work remaining in the country is being a super-innovative techie of some sort. This is not an oversight. Friedman doesn’t ignore low-wage jobs just because they’re beneath his notice. Pretending that they simply don’t exist is the product of a worldview that treats corporate decisions, and government support for corporate needs, as a fact of nature: Decent jobs that demand little formal training haven’t been transformed into bad jobs by the erosion of the minimum wage, the decline of unions and the upward redistribution of companies’ budgets. They’ve simply disappeared in a puff of technology. For over a decade, working Americans of all races have seen their wages and incomes stagnate. Even as corporate profits soar, even as the pay of a fortunate few explodes, inequality has steadily risen over the decades. Upward mobility has become harder. In too many communities across this country in cities and suburbs and rural hamlets, the shadow of poverty casts a pall over our youth, their lives a fortress of substandard schools and diminished prospects, inadequate health care and perennial violence. And so as we mark this anniversary, we must remind ourselves that the measure of progress for those who marched 50 years ago was not merely how many blacks had joined the ranks of millionaires; it was whether this country would admit all people who were willing to work hard, regardless of race, into the ranks of a middle-class life. (Applause.) The test was not and never has been whether the doors of opportunity are cracked a bit wider for a few. It was whether our economic system provides a fair shot for the many, for the black custodian and the white steelworker, the immigrant dishwasher and the Native American veteran. To win that battle, to answer that call -- this remains our great unfinished business. We shouldn't fool ourselves. The task will not be easy. Since 1963 the economy's changed. It was at first and even second glance an impressively rare synopsis of the economic straitjacket in which the nation finds itself. The President noted "the twin forces of technology and global competition have subtracted those jobs that once provided a foothold into the middle class, reduced the bargaining power of American workers." Pretending that they (low-wage jobs) simply don’t exist is the product of a worldview that treats corporate decisions, and government support for corporate needs, as a fact of nature: Decent jobs that demand little formal training haven’t been transformed into bad jobs by the erosion of the minimum wage, the decline of unions and the upward redistribution of companies’ budgets. They’ve simply disappeared in a puff of technology. But In most respects, Friedman's disturbing worldview is strikingly similar to that of Obama. The NYT columnist fails to acknowledge "factories are increasingly automated, iPhones are made in China, a table-side console could replace waiters, and, voilà, the only work remaining in the country is being a super-innovatie techie of some sort." He implies low-wage jobs have "disappeared in a whiff of technology." Similarly, President Obama refers to forces which "have subtracted those jobs that once provided a foothold into the middle class," jobs magically disappeared into thin air. He mentions "global competition" uncritically while Friedman asserts the middle-class job often "requires more skill or can be done by more people around the world." Neither man is particularly troubled by the trade imbalances which characterize globalism. Obama does concede "working Americans of all races have seen their wages and incomes stagnate," but only while "corporate profits soar." This is hardly a concession, given that- in and of itself- an increase in corporate profits is beneficial to society. But nowhere does he (or Friedman) suggest that those profits may be soaring on the backs of those workers, whose pay and benefits companies have tamped down to maximize profits. Entrenched interests -- those who benefit from an unjust status quo resisted any government efforts to give working families a fair deal, marshaling an army of lobbyists and opinion makers to argue that minimum wage increases or stronger labor laws or taxes on the wealthy who could afford it just to fund crumbling schools -- that all these things violated sound economic principles. This was, however, pretty weak tea, and there is little indication, despite frequent (such as here, here and here) criticism,that even Friedman would oppose an increase in the minimum wage. But he fails to understand, Gershon finds, "the idea that low wages aren't the natural product of a (mythical) free market but of business and government decisions." With his superior intellect and experience as a community organizer, Barack Obama presumably recognizes the controlling impact of business and government decisions upon the ever-growing inequality in American society. But he fails to acknowledge the impact of the decline of unionization, even eschewing the term "union" for the less controversial "workers." Nor does he cite cite the "upward redistribution of companies' budgets" and, like Friedman, evinces little discomfort with the export of American jobs. With a worldview mired in fantasy, Tom Friedman deserves considerable criticism, but not while the President of the United States is seemingly immune. Oh, but for the good old days when Republicans were in favor of nothing but cutting income taxes- and practically admitted it. Think Progress takes us back to those times, before President Clinton on August 10, 1993 signed the Omnibus Budget Reconciliation Act of 1993, nicknamed (not really) by Republicans as "The Path to Hell.Act." In February of that year, Representative Bill Archer of Texas maintained he wished Clinton's program would "increase jobs and the standard of living (but) his massive tax increases will do just the opposite." Representative Thomas Ewing of Illinois contended "the Clinton plan will hurt the economy and kill new job creation... by crippling small- and medium-sized businesses, the plan will kill jobs." The following month, Rep. Phil Crane of Illinois argued "the budget proposal offered by the Democrats is a recipe for economic and fiscal disaster." Representative Jim Ranstad of Minnesota claimed "Economists across the ideological spectrum are convinced that the Clinton tax increases will lead to widespread job loss." May brought California's Christoper Cox labeling the tax increase a "Dr. Kevorkian plan for our economy" (which) "will kill jobs, kill businesses, and yes, kill even the higher tax revenues that these suicidal tax increasers hope to gain." Texas' Bill Archer argued the plan would cut jobs "and the standard of living for Americans." In July, Representative Bob Goodlatte of Georgia contended small businesses "will be the hardest hit by the Clinton tax-and-spend budget because when you raise taxes, you kill jobs." The following month, the budget plan was condemned by Representatives Kasich, Dornan, Armey, and Helflin, the latter notably claiming it "will raise your taxes, increase the deficit, and kill over 1 million jobs." We have all too many people in the Democratic administration who are talking about bigger Government, bigger bureaucracy, more programs, and higher taxes. I believe that that will in fact kill the current recovery and put us back in a recession. It might take 1 1/2 or 2 years, but it will happen. And those Republicans backed their words with action, for every Republican in the House of Representatives voted against the budget. The GOP's solidarity held firm in the Senate, with the increase opposed by each of its members, including Oklahoma's Don Nickles, Utah's Orrin Hatch, Iowa's Chuck Grassley, and Kentucky's Mitch McConnell, who predicted the "package will not reduce the Federal debt, or even balance one annual budget for that matter." In retrospect, the tax increase was the centerpiece of President Clinton's economic plan, which helped create the longest period of economic growth in United States history and balanced budgets, one of which was handed to President George W. Bush, who quickly (and intentionally) squandered it. A party whose leaders have backbone would acknowledge their error. It would embrace its position of 1993 and emphasize that the Republican Party is the party of lower taxes, or that the stock market boom and/or dot-com bubble was largely responsible. But no, because dishonesty is the easy way out, and if Republicans cannot misinform their supporters, they really have no reason to exist. Last December, MSNBC's Lawrence O'Donnell asked Gingrich for an apology for predicting the Clinton budget would produce a recession, whereupon the former Speaker and future Crossfire host claimed "When we balanced the budget, we balanced the budget with a tax cut, not a tax increase. Four consecutive balanced budget with a tax cut, not a tax increase. " I think you're exactly right about the history of 1995, that there was some short-term political pain. But, at the same time, because Republicans stood together, we saw year after year of balanced budgets which never would have happened if Republicans had folded like they're trying to fold right now. You knew nothing could be accurate when it starts with "(Rush), I think you're exactly right." Here he was, an African American twice elected to the nation's highest office. Half a century ago, that was beyond the imagination of those who gathered on the Mall. They were fighting for the right to vote, the right to ride buses, the right to get work. They dreamt (sic) of winning city council seats. But a little boy who had just turned two, liberated by the gains won by those who marched, dreamt (sic) bigger. Because he did – and because they marched – Obama did not have to say anything. Fifty years from now, few will remember what he did say. But they will remember that he was there to represent the country. Martin Luther King is remembered less today (or at least the past few days) for having been at the March on Washington than for the speech he gave. While President Obama will be remembered for having been there on Wednesday, he would have been remembered even more vividly if he did not appear. At least, I think so and-given that he did appear- we'll never know otherwise. The graph below (period of 1948-2011) from the Economic Policy Institute demonstrates that growth in productivity has far outstripped the growth in wages, even without accounting for the lag in total compensation, which has been even more severe because of a relative reduction in employee benefits through time. The President could have used the occasion of his speech to call for a higher federal minimum wage which at $7.25 per hour is $1.12 lower than it would be today ($8.37) if it were adjusted for inflation. And if it were adjusted for productivity growth, the minimum wage would be $16.54 in 2012 dollars, according to Dean Baker. And he might have informed the nation that economic mobility in the U.S.A. now is exceeded by that in Europe. Yet the President could have ended on an uplifting note, applauding the thousands of fast food workers who went on strike Thursday in dozens of cities across the country. And that, more than any speech given by Barack Obama, Bill Clinton, or anyone (save possibly John Lewis) is a greater way to celebrate the the life of Reverend Dr. Martin Luther King who, we are supposed to forget, was assassinated while in Memphis, Tennessee, supporting striking sanitation workers. Labels: Barack Obama, Martin Luther King Jr. He thinks he's the smartest person in the room; he's deceiving himself by thinking he's the smartest person in the room. Hasn't that always been something I've said about him? But here again is the assumption: "Oh, he's smart! Oh, oh, oh, Charlie! Oh! He has high abilities. He's bright, obviously bright, Charlie!" Where's the evidence? Would somebody show me the evidence of this? Well, I think the root of that is that depending on who's doing the categorization here, the fact of the matter is that the smartest people in the room usually aren't the smartest people in the room. Mrs. Clinton is nowhere near the smartest woman in the world. And I don't think Obama is particularly smart or competent. But the conventional wisdom is just the opposite, that those two are the smartest. As he moved on to Syria, Rush snarked "Man, what a smart guy. I understood everything he was trying to say, didn't you? Man, and that's rare, folks, that I have been in the presence of such smartness and such brilliance. I mean, he really, really, really handed it to Bush there! Did you hear that?" Rush Limbaugh is demonstrably wrong- whether wise or not, Barack Obama is the smartest man in the room... figuratively, literally, and otherwise. As Commander-in-Chief, the President does have a duty to protect and defend the United States. In instances of self-defense, the President would be within his constitutional authority to act before advising Congress or seeking its consent. History has shown us time and again, however, that military action is most successful when it is authorized and supported by the Legislative branch. It is always preferable to have the informed consent of Congress prior to any military action. The question centered on use of American military force in the absence of an imminent threat to the nation and the takeaway was comforting to a nation tiring of war. Obama conceded "the President does not have power under the Constitution to unilaterally authorize a military strike" in many circumstances, and he seemed to emphasize the importance of military action being "authorized and supported by the Legislative branch." Q In 2007, the Boston Globe asked candidates running for president to answer a series of written questions, and one was in the context of Iran: Does the President have the constitutional authority to bomb Iran without seeking a use of force authorization from Congress? Candidate Obama said, "The President does not have the power under the Constitution to unilaterally authorize a military attack in a situation that does not involve stopping an actual or imminent threat to the nation." Does the President still agree with that? Q But it's not a hypothetical anymore. MR. CARNEY: It is a hypothetical, Ed. Q You have to admit the military option has been on the table for a year, a year and a half. Q Now it's not about hypotheticals. We are maybe within days, if not hours, of the President making a decision, correct? MR. CARNEY: It is correct that the President is working with his national security team reviewing the options available to him to respond to the clear violation of an international norm by the Syrian regime with the use of, on a significant scale, chemical weapons against innocent civilians, A. B, as I made clear, it is clearly in the United States' national security interests that that norm be maintained because the consequences of that standard dissolving are enormous and very detrimental to the interest of the United States and very detrimental to the international community, to our allies and partners in the region, and to the world at large. Q But you're saying that's the standard today. But I'm saying the standard in 2007 to candidate Obama was an actual or imminent threat to the nation. Do you believe that exists right now, an actual imminent threat to the United States? MR. CARNEY: I believe that absolutely allowing the use of chemical weapons on a significant scale to take place without a response would present a significant challenge to or threat to the United States' national security interests. Q Not just to our allies in the region, but to the United States? Noting Carney's explanation, Alex Altman and Zeke Miller of Time write "The White House also argues that the atrocities allegedly committed by the Syrian regime met the 'imminent threat' test Obama set forth in 2007. Allowing Syria to violate international standards prohibiting the use of chemical weapons would pose future threats to the U.S."
Actually, no. Carney sidestepped the issue of an imminent threat by specifying "a significant challenge to or threat to the United States' national security interests." The President's position, therefore, actually is consistent with his inference in 2007 that the President can act unilaterally if the action were to "involve stopping an actual or imminent threat to the nation." He did not say an actual and imminent threat, but an actual or imminent threat, and Obama can legitimately (though not necessarily justifiably) argue that use by the Syrian regime of a chemical weapon presents an "actual threat" to the U.S.A. or its "national security interests." "Punitive action is the dumbest of all actions," he said. "The Assad regime has shown an incredible capacity to endure pain and I don't think we have the stomach to deploy enough punitive action that would serve as a deterrent." He also doubted the effectiveness of taking out Assad's chemical weapons capabilities. "If we start picking off chemical weapons targets in Syria, the logical response is if any weapons are left in the warehouses, he's going to start dispersing them among his forces if he hasn't already," he continued. "So you're too late to the fight." One U.S. official who has been briefed on the options on Syria said he believed the White House would seek a level of intensity "just muscular enough not to get mocked" but not so devastating that it would prompt a response from Syrian allies Iran and Russia. "They are looking at what is just enough to mean something, just enough to be more than symbolic," he said. He will do it again because we have given him,instead of a red line,we've given him a green light and to do that and many other atrocities committed. The previous day, McCain had warned "our friends and enemies alike, both in the Middle East and across the world, are questioning whether America has the will and the capacity to do what it says." Yes, that surely was an historic election in 2008. Or As Steve Colbert Says, "I Don't See Race"
Governor Bobby Jindal suffers from: a) hypocrisy; b) naivete; or c) both. The surprise answer is (b), naivete. Yet we still place far too much emphasis on our “separateness,” our heritage, ethnic background, skin color, etc. We live in the age of hyphenated Americans: Asian-Americans, Italian-Americans, African-Americans, Mexican-Americans, Cuban-Americans, Indian-Americans, and Native Americans, to name just a few. As Republicans and Democrats; gay and straight; Protestants, Catholics, Jews and, increasingly, Muslims and individuals of other religious faiths, we are a diverse and sometimes wonderfully motley mixture of people. Formed into a mosaic, we are at our best. Mitt Romney had planned to celebrate his election as the nation’s 45th president with an eight-minute fireworks display over Boston Harbor. The same company that does some of the illuminations for Boston’s Fourth of July celebration was poised to ignite fireworks within view of Romney’s party at the Boston Convention & Exhibition Center to celebrate a win over President Obama. A permit filed with the City of Boston said the detonation could occur any time between 7 p.m. Tuesday, just after the first polls closed, and 12:30 a.m. Wednesday, which ended up being just before Romney conceded the race. And that victory by the man who "seems to have darker skin than most Americans" came from the support of less than 40% of white people. It's reasonable that 59% of voters selected Mitt Romney for what was undoubtedly a variety of reasons. But Jindal's implication that we all came together, regardless of ethnic background, to vote to re-elect the black man is extraordinarily naive. And if the election/re-election demonstrated our glorious imperviousness to the nefarious pull of ethnicity, a reasonable question or two arises: did Jindal vote for Obama? If not, did his vote against Obama prove that he is racist? (probably not and no). Enough Americans did vote for Barack Obama for him to be re-elected. And now, less than a year afterward, how have members of Jindal's own party (though not he himself) reacted? ...it would be a “dream come true” to submit a bill to impeach President Obama. Bentivolio also said he had meetings with lawyers asking them to “tell me how I can impeach” the president of the United States. Bentivolio was speaking at the August 2013 Birmingham Bloomfield Republican Club Meeting. Three days later, answering a constituent's question about impeachment, Oklahoma Senator Tom Coburn maintained "I don’t have the legal background to know if that rises to high crimes and misdemeanor, but I think they’re getting perilously close.” Back in January- little more than two months after the vote which allegedly proved that the nation bears no ill will toward blacks- Texas Representative Steve Stockman threatened to pursue impeachment of the President if he introduced gun control measures by executive order. None of the GOP members of Congress with dreams of impeaching the President of the United States has laid out, to satisfy requirements of the U.S. Constitution, the "high crimes and misdemeanors" Obama has committed. (And Jindal himself opposes impeachment.) Still, impeachment has to be considered... for some reason. At least, Bill Clinton had to lie to a grand jury, albeit about nothing pertaining to the job he was elected to perform (performance not having been among Clinton's problems). In President Obama's case, he- oh, come to your own conclusions. David Sirota argues in Salon that President Obama might be lying or is blissfully unaware about spying by the National Security Agency. In July, the Chief Executive had appeared on the CBS morning show to claim the secret Foreign Intelligence Surveillance Act court is "transparent." In early August, he told NBC's Jay Leno "we don't have a domestic spying program." And on August 9, the President in a news conference maintained "what you're not reading about is the government actually abusing these programs and listening in on people's phone calls or inappropriately reading people's e-mails. What you're hearing about is the prospect that these could be abused." Given the President's statements, he might have been unaware that The New York Times had reported in April 2009 "several intelligence officials, as well as lawyers briefed on the matter, said the NSA had been engaged in 'overcollection' of domestic communications of Americans." The National Security Agency has broken privacy rules or overstepped its legal authority thousands of times each year since Congress granted the agency broad new powers in 2008, according to an internal audit and other top-secret documents. The NSA audit obtained by The Post, dated May 2012, counted 2,776 incidents in the preceding 12 months of unauthorized collection, storage, access to or distribution of legally protected communications. Most were unintended. Many involved failures of due diligence or violations of standard operating procedure. The most serious incidents included a violation of a court order and unauthorized use of data about more than 3,000 Americans and green-card holders. For example, she said, in the world of business, a pattern of phone calls from key executives can reveal impending corporate takeovers. Personal phone calls can also reveal sensitive medical information: “You can see a call to a gynecologist, and then a call to an oncologist, and then a call to close family members.” And information from cell-phone towers can reveal the caller’s location. Metadata, she pointed out, can be so revelatory about whom reporters talk to in order to get sensitive stories that it can make more traditional tools in leak investigations, like search warrants and subpoenas, look quaint. “You can see the sources,” she said. When the F.B.I. obtains such records from news agencies, the Attorney General is required to sign off on each invasion of privacy. When the N.S.A. sweeps up millions of records a minute, it’s unclear if any such brakes are applied. Metadata, Landau noted, can also reveal sensitive political information, showing, for instance, if opposition leaders are meeting, who is involved, where they gather, and for how long. Such data can reveal, too, who is romantically involved with whom, by tracking the locations of cell phones at night. I just don’t buy that he’s so unaware of the world around him that he made such statements from a position of pure ignorance. On top of that, he has a motive. Yes, Obama has an obvious political interest in trying to hide as much of his administration’s potentially illegal behavior as possible, which means he has an incentive to calculatedly lie. For all of these reasons, it seems safe to suggest that when it comes to the NSA situation, the president seems to be lying. President Obama is not planning to campaign for Democrat Barbara Buono in her quest to rob Gov. Chris Christie of a second term, the Associated Press reported yesterday. This year and next, Obama only plans to lend his political firepower to close races where he could help cinch a win for his party, a Democratic official involved with Obama’s political plans told AP. The official wasn’t authorized to discuss strategy and requested anonymity, the wire service said. This comes on the heels of a recent poll showing State Senator Buono gaining on Christie, though she still trails quite a bit. It comes from a President who is still popular in New Jersey, a state he carried in 2012 by 17.75 percentage points. And it comes from a President who three days earlier had endorsed New Jersey's Democratic U.S. Senate candidate, Cory Booker, who at the time was found to be leading his GOP opponent by 16 points. When it comes time to make a difference, President Obama is nowhere to be found. In 2007 Senator Obama vowed (video below) "And understand this: If American workers are being denied their right to organize and collectively bargain when I’m in the White House, I’ll put on a put on a comfortable pair of shoes myself. I’ll walk on that picket line with you as president of the United States.” When public sector workers in Wisconsin needed his support against the effort by Republican governor Scott Walker to crush their unions, Obama stayed silent.When Scott Barrett ran against Walker in the subsequent recall election, the President endorsed the Democrat- but tepidly, and at the last moment, when he knew his support would be relatively inconsequential. President Obama apparently wants to make sure he backs only the winning horse, in elections as elsewhere. Best of luck to the people of Syria. The killing fields go on. Two young men and one juvenile are accused of gunning down an Australian baseball player, jogging in the Oklahoma town of Duncan, for "the fun of it," as the 17-year old reportedly has acknowledged. The Trayvon Martin shooting? I'll just tell you something: From Obama on down, they didn't care about Trayvon Martin. All that mattered was that incident offered them an opportunity to advance their political agenda. This doesn't. Everything to these people is political. There's nothing about this Oklahoma shooting that will allow the left or the Democrats to advance their political agenda. This harms their agenda, so that's why the media is not trumpeting it. Tim Fischer, who served as deputy prime minister under John Howard from 1996 to 1999, urged Australians not to travel to the United States. He said that such a boycott would send a message about the need for tighter gun control regulations in the United States, according to News.com.au. “I am deeply angry about this because of the callous attitude of the three teenagers (but) it’s a sign of the proliferation of guns on the ground in the USA,” Fischer said this week. “This is the bitter harvest and legacy of the policies of the NRA ..."
As deputy prime minister, Fisher led Australia’s gun control reforms in the late ‘90s alongside Howard. It's ironic, because Australia is proof that things in America don't have to be this way. Before enacting saner gun laws, the Land Down Under had witnessed 13 mass killings in 18 years. Since legislation was passed there have been none. Let me repeat that: None. Isolated murders by gunfire have not been eliminated there, of course, but they have dropped substantially -- down 59 percent over a decade. And the last I heard, Australia has not become a tyrannical hellscape because of its saner gun laws. A 20-year-old man with mental disabilities apparently accidentally shot and killed his 15-year-old sister Thursday afternoon in St. Louis, police say. The man told police he didn’t know the gun was real, according to authorities. St. Louis Police Lt. John Green said that the man and his family moved into a home in the 4600 block of San Francisco Avenue a few days ago, and that the man had found a shotgun — spray-painted gold — hidden behind a dresser. The gun belonged to a friend of the family and was there when the family moved in, Green said. The shooter’s mother told police she had tried to hide the shotgun. Authorities identified the victim as Alicia Anderson. Several relatives at the scene Thursday declined comment. Incidents such as the T. Martin and A. Anderson killings are attributed to race by conservatives, who are blamed by liberals for pointing the fingers at blacks. Apparently, Australians are more-cleared than are we because, Bunch finds, they are mystified when they "look at our failure to act after a slaughter like the Newtown massacre, at our seeming tolerance of dozens of gun muders like that of Chris Lane every day." And now, we have yet another victim of our fondness for firearms, this time of someone even younger than was Trayvon Martin. "The only thing in the middle of the road," famed Texan Jim Hightower once reputedly quipped, "is a dead armadillo." Apparently, Jim Hightower actually said "The middle of the road is for yellow lines and dead armadillos." Either way, it was not meant as a compliment to the middle of the road, unless Hightower suffers from an unhealthy attraction to dead armadillos. The aphorism is nowhere more true than in the manner of immigration reform. Six weeks ago, U.S. Representative Loretta Sanchez of southern California, asked by MSNBC host Alex Wagner whether "Democrats" would be "willing to accept a path to legalization and not a path to citizenship," eventually conceded "There's always room for debate... There's always room to talk and we'll continue to talk with them." Sanchez's response was not only dangerous strategy- "negotiating against oneself," is the cliche- but disturbing policy. More reassuring and inspiring, though less sincere, was the comment of Gang of Eight member Chuck Schumer (tough guys- they were part of a "gang," with no fear of being stopped and frisked). The New York senator stated "America has stood for citizenship, we have a Statue of Liberty here. It never has said, 'You come here and you'll be second class. We will not stand for it. It will not happen." calls upon the President and Congress to create a new work permit program that will allow foreign nationals who are currently in the country and have not violated any other laws of the U.S. to come forward and register and be allowed to remain and work in the U.S. The work permit will not result in application for citizenship nor any family members entering the U.S. and will require renewal every two years upon roof of continuous employment with no more than two (2) months per two (2) year period unemployed or conviction of a crime. Well, there you have it. We would gladly welcome immigrants to come to the U.S. to compete with citizens for a scarce number of jobs. Our economy is increasingly dependent upon part-time work, temporary employment, paid and unpaid internships, "job training" for non-existent jobs, and any other scheme to replace full-time, permanent employment with benefits. But it must more resemble a servant economy. And not only can the newcomers work- with no hope of citizenship- they will have to renew the work permit every two years. Don't ever, ever cross your employer! Legalization without citizenship is, as comprehensive immigration reform opponent Mickey Kaus identifies it, "the worst of both worlds." It would create two class of citizens, as former Harry Reid aide Jim Manley has argued. Kaus suggests the nation "Stop importing unskilled immigrants until labor markets tighten and wages rise as employers compete for harder-to-get workers. Then admit immigrants only to the extent it won’t deny workers at the bottom reasonable wage increases." That would, obviously, run counter to the insistence of Democrats, Sanchez and Schumer alike, to encourage further immigration and simultaneously deny Republicans their dream of a pitilessly paid, permanent, underclass. It would have only the nation's welfare to commend it and thus is highly unlikely. One way or another, this does not end happily. Governor Chris Christie has tried to pull off a hell of a three-card Monte on New Jersey voters, national Republican primary voters and the national local press. Check it out. Today Governor Christie signed A3371 into law, a bill that bans licensed therapists from attempting so-called gay conversion therapy on minors. There are no cameras or photographers present, but the governor released a statement saying, "The American Psychological Association has found efforts to change sexual orientation can pose critical health risks including but not limited to depression, substance abuse, social withdrawal, decreased self-esteem and suicidal thoughts. .But OK. That a boy, Chris Christie. This is, after all, what we might expect from a governor for a state that went for President Obama by 17 points in the last election. This past Friday, however, another Chris Christie was at work and that Chris Christie did something after 6:00 pm in the summer on a Friday when all the reporters had gone for the weekend. That Chris Christie vetoed a ban on a military sniper rifle, the Baretta .50 caliber long-range rifle. Here`s the big military rifle, a weapon that has no plausible civilian use. It`s more or less a war toy for amateur gun enthusiasts. The ban was one previously called for, wait for it, Chris Christie himself, last April. But now Christie says the bill goes too far by prohibiting current owners from keeping their guns. Or it could be that a group called Pro-Gun New Hampshire, interesting state, rallied out-of-state gun supporters to push Christie to veto the bill with 2016 in mind.This is the Chris Christie dance, and it`s the one we will get to see as he runs for re-election this year in a state with lots of liberals but positions himself with conservatives ahead of 2016, but keep this in mind, as soon as Election Day hits in November, if Chris Christie wins the second term, there will be no immediate need to strike such a balancing act. After Election Day, as Hayes recognizes, there will be little if anything restraining the Governor. But he will win a second term because other than he and the Governor's Democratic opponent, Barbara Buono, there are few individuals calling out the Governor. And no one is listening to Buono, in part because- unlike New Jersey's Democratic senatorial nominee, she is an actual Democrat. Futher, Christie will easily win re-election because he is adept at being an ideological extremist when no one but Repub wingers are watching, while choosing his spots to stray slightly- and inconsequentially- from the right-wing script. And inconsequential it is. According to The Philadelphia Inquirer, the Southern Poverty Law Center maintains there are two- 2- therapists in New Jersey indicating they offer gay conversion therapy. And the SPLC has filed a lawsuit against one of them. No, conversion therapy, even for minors, presents little threat because it is not widely employed. (It is a minor threat to minors.) Most of the text of the bill (text, here) is taken up by a list of particulars against conversion therapy, in arguing that it is completely without merit and even dangerous. Section 1(k), for instance, quotes the American Academy of Child and Adolescent Psychiatry contending the treatment "may encourage family rejection and undermine self-esteem, connectedness and caring, important protective factors against suicidal ideation and attempts." And on and on and on. The reasoning of the NJ state legislature and its governor may be summed up by the statement, attributed in the legislation to the National Association of Social Workers: "No data demonstrates that reparative or conversion therapies are effective, and, in fact, they may be harmful." Support for gay minors as gay individuals, without attempting to change their sexual orientation, is urged throughout. Aside from designating family planning funds for CPCs, states can endorse them in a few other ways that sometimes slip under the radar. Some states have unnecessary restrictions on abortion that require women to undergo a mandatory counseling session or ultrasound procedure before being allowed to terminate a pregnancy, and choose to direct women to CPCs to fulfill those requirements. Or states can sell specialty license plates with pro-life messages, the proceeds of which directly fund CPCs. For example, a recent NARAL investigation found that Virginia’s Department of Health currently refers low-income women to a list of 18 CPCs where they can receive a free ultrasound before getting an abortion. But when women visit those centers, they encounter misinformation about the abortion procedure — typically, false information about abortion’s link to breast cancer and depression. The staff at Virginia’s CPCs was also documented employing emotional manipulation, like writing “Hi, Dad” on the image of an ultrasound before handing it back to a patient. In extreme cases, CPC employees have even refused to turn over the ultrasound results to women who needed to bring them to an abortion clinic. CPCs advertise themselves as viable alternatives to other women’s health clinics, even though they don’t tend to employ medical professionals and don’t offer the full range of reproductive health services. Multiple outsideinvestigations have caught CPCs’ lies on tape. Women who visit the right-wing “clinics” are frequently told that emergency contraception is the same thing as an abortion, birth control contains carcinogens, condoms aren’t effective at preventing STDs, abortion is extremely dangerous, and women always regret ending a pregnancy. Those type of emotionally manipulative tactics designed to convince women not to have an abortion typically increase their negative emotions about the experience, but don’t ultimately lead them to change their mind or regret their decision. Ninety percent of women have made up their minds about having an abortion before visiting a doctor or a clinic. These women visit a counseling clinic and are met with deceit. But most choose to go ahead with the abortion despite the active effort to convince them they are murderers. And when young people undergo reparative or conversion therapy, most (if not all) remain gay, despite efforts to convince them they are on the road to hell, suicide, or both. There are, of course, differences. But the most important is that the clinics or counselors now forbidden in New Jersey to ply their wares are private or non-profit institutions. It appears neither therapist in that state take public funding nor do they in other states. (If they do, every reporter has neglected to inform us, and has practiced journalistic malpractice.) Crisis pregnancy centers, however, often receive public funding. They are not marketing fiction, but they may be doing it on the public's dime. Between the two chambers of the New Jersey legislature, seventeen (17) lawmakers sponsored or co-sponsored A3371, the bill signed by Governor Christie. We await seventeen legislators promoting a bill prohibiting the state's crisis pregnancy centers from doling out false information to pregnant, typically anxiety-ridden, women of the state. Grover Norquist, who has probably harmed the USA more than everyone the past 30 years, is famous for two things: the Taxpayer Protection Pledge and a quote assuring us of the purpose of the Pledge. It was in 2001 that Norquist infamously asserted "I don't want to abolish government. I simply want to reduce it to the size where I can drag it into the bathroom and drown it in the bathtub." He hasn't quite gotten there, but is making serious progress. And in Pennsylvania, the nation's least popular governor, Repub Tom Corbett is doing his best to make Norquist's boast a reality. the school district is facing end times, with teachers, parents and students staring into the abyss created by a state intent on destroying public education. On Thursday the city of Philadelphia announced that it would be borrowing $50 million to give the district, just so it can open schools as planned on Sept. 9, after Superintendent William Hite threatened to keep the doors closed without a cash infusion. The schools may open without counselors, administrative staff, noon aids, nurses, librarians or even pens and paper, but hey, kids will have a place to go and sit. The $50 million fix is just the latest band-aid for a district that is beginning to resemble a rotting bike tube, covered in old patches applied to keep it functioning just a little while longer. At some point, the entire system fails. Things have gotten so bad that at least one school has asked parents to chip in $613 per student just so they can open with adequate services, which, if it becomes the norm, effectively defeats the purpose of equitable public education, and is entirely unreasonable to expect from the city’s poorer neighborhoods. The needs of children are secondary, however, to a right-wing governor in Tom Corbett who remains fixated on breaking the district in order to crush the teachers union and divert money to unproven experiments like vouchers and privately run charters. If the city’s children are left uneducated and impoverished among the smoldering wreckage of a broken school system, so be it. To be clear, the schools are in crisis because the Commonwealth of Pennsylvania refuses to fund them adequately. The state Constitution mandates that the Legislature “provide for the maintenance and support of a thorough and efficient system of public education,” but that language appears to be considered some kind of sick joke at the state capital in Harrisburg. It’s worth noting that the state itself runs the Philadelphia School District after a 2001 takeover. The state is also responsible for catastrophic budget cuts two years ago that crippled the district’s finances. And in a diabolical example of circular logic, the state argues that the red ink it imposed, and shoddy management it oversees, are proof that the district can’t manage its finances or its mission and therefore shouldn’t get more money. Make no mistake, on the aggregate the district does not perform well. Only slightly more than 60 percent of students graduate from high school, with less than 60 percent proficient in reading and math. But put that in the context where 80 percent of students come from disadvantaged backgrounds while administrators struggle to cobble together enough cash to even open doors, let alone provide a safe, rich and comprehensive educational experience. Particularly noxious lawmakers are fond of spouting the ridiculous notion that money can’t help struggling schools, as if more and better-trained staff, better equipment and diverse programming wouldn’t make a difference in kids’ educations and their lives. The timing of this meltdown is unfortunate, as if there were ever a good time for the euthanasia of public schooling. According to the 2010 census, Philadelphia grew in population for the first time in 60 years, changing direction from decades of decline. Most of that growth came from immigrants who will rely on public schools — or not, as the case may be. Another area of growth was in young families, who will face a choice, once they have school-age children, to stay in the city or flee to superior suburban schools as previous generations have done. Nearly the entire burden to keep the district afloat has fallen to the city, which raised property taxes each of the two previous years specifically to funnel extra money that the schools weren’t getting from the state. This is in one of the poorest and most highly taxed cities in the nation. The floundering district is both a symptom and cause of the city’s predicament, creating a vicious cycle of people who can afford to bail moving to the suburbs, leaving a crippled tax base, with the result being less money to fix the schools and ever-higher taxes imposed on those who stay. Unlike the city, the state could come up with the necessary cash without excessively burdening its finances. Pennsylvania has the lowest severance tax of any state drilling for Marcellus shale gas, with plenty of room for an increase. The state had a modest surplus at the end of the last budget year. The governor has no trouble coming up with money to build new prisons, which will serve as future homes for all too many children of Philadelphia who are being failed and tossed aside by adult leadership, if you can call it that. The pattern has become clear: defund the schools, precipitate a crisis and use that as an excuse to further attack the schools, pushing them closer and closer to a point of no return. The $50 million to open the schools this year is just the latest and most immediate example of three years of brinkmanship. Public transit cutting routes and upping fares? Parks shuttering Little League fields? Bridges going unmaintained until they fall into rivers? Firefighters letting homes burn because the owner hasn't paid a $75 fee? Cops watching a man drown because they can no longer afford water-rescue training? (Those last two? Really happened.) Do this long enough, and pretty soon the snake starts eating its own tail: We underfund public services, therefore public services don't work, therefore we underfund them. After that, of course, people become even more irritated at the inability of the public sector to provide basic services and thus demand further cuts as the cycle repeats. The anti-tax, anti-government fanaticism of Grover Norquist is playing out across America as planned. Sometime between admitting he likes to "fire people" and criticizing the 47% of the populace he says "are dependent upon the government, believe they are victims," Mitt Romney in January, 2012 complained about Barack Obama allegedly practicing class warfare. Asked whether there are "fair questions about the distribution of wealth without it being seen as envy," vote fraudster Romney replied "I think it's fine to talk about those things in quiet rooms and discussions about tax policy and the like. But the president has made it part of his campaign rally." It may be true, but we wouldn't want the poor and the elderly and the middle class and all the other degenerates to hear about it, would we? Tara Culp-Ressler of Think Progress recently noted that 34 states (map below, from NARAL Pro-Choice America) indirectly or directly subsidize so-called Crisis Pregnancy Centers, which employ deceptive marketing tactics suggesting they provide reproductive health services they do not offer. (Kudos to the Sweet 16: California, Colorado, Connecticut, Illinois, Iowa, Maine, Michigan, Nevada, New Hampshire, New Mexico, New York, Oregon, Rhode Island, Vermont, Washington, Wyoming.) 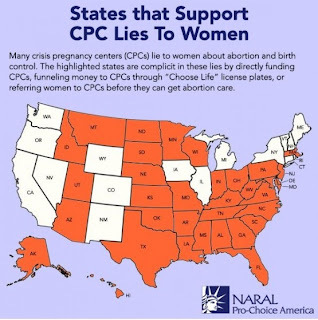 The National Abortion Rights Action League recently investigated the CPC facilities and found four ways in which pregnant women are deceived. They are told abortion causes breast cancer and that it will destroy your chances of having children in the future, is extremely dangerous, and will ruin their life. Abortion serves as a litmus test for conservatives. But the GOP flavor of the month, in the party's effort to divert attention from comprehensive immigration reform, is the Affordable Care Act. In June, after being threatened by Republican congressional leaders, the National Football League declined a request from the Department of Health and Human Services to join in its effort to inform Americans of provisions of health care reform, denying consumers the opportunity to learn of their options. The GOP remains the anti-science party. It's hard to believe that educated individuals with an I.Q. over 60 or 70 could really honestly think that climate change is "speculation," not "fact." And in all likelihood, they don't believe that. Hurricane Sandy victims told members of the New Jersey Legislature during a session here Thursday that they have grown weary of "Stronger Than the Storm" ads, and are exhausted by months of futile attempts to seek assistance in repairing and holding on to their storm-ravaged homes. "I haven't seen one billboard or ad that tells people exactly how they can be stronger than the storm. . . . So many people still don't know where to go for help," said Staci Berger, executive director of the Housing and Community Development Network of New Jersey. Berger testified before the Joint Senate and Assembly Environment Committee about the hundreds of Shore homeowners her agency has been trying to assist since the Oct. 29 storm. The session was held at the Atlantic City Convention Center so legislators - among them State Sen. James Whelan (D., Atlantic) and Assemblywoman Holly Schepisi (R., Bergen) - could hear about the status of rebuilding efforts at the Shore. And that status, nearly 10 months after the horrific storm created $38 billion in damage in New Jersey, is: Not so great. Officials say thousands of New Jersey residents still have not been able to return to their homes, while thousands more joined the unemployment rolls as some businesses remain shuttered after the storm trounced the state. Others are on the brink of losing their properties to foreclosure because some banks and insurance companies refuse to offer assistance while residents get back on their feet. So many people still don't know where to go for help, stated the director of a statewide association dedicated to helping victims of the hurricane which has proven a boon to Chris Christie's celebrity. Of course not. If billboards actually informed residents of the state, New Jerseyans would know where to go for help. That is not their purpose. Growing class division and diminished socio-economic mobility. The safety of abortion.Climate change. Hurricane relief. They're part of an effort to keep individuals in the dark. We may be witnessing contempt for the American people, an effort to skew the public debate on various issues in their direction, or a piece of a random pattern. But we do know, as did Albert Camus, "le mal quiest dans le monde vient presque toujours de l'ignorance." In January, Mother Jones' Kevin Drum included "the end of the crack epidemic, changes in policing tactics, higher incarceration rates, and more" as explanations for the drop in violent crime over the past two decades. 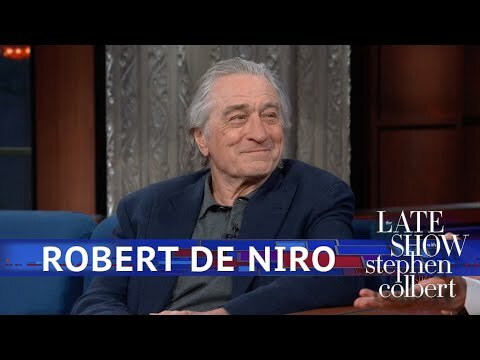 This past week, he noted as explanations for the continuing (but declining) disparity between the crime rate of black teens and that of white teens as "the toxic legacy of racism and slavery; poverty rates in inner cities; gang culture; and many more." The "more" and the "many more" ought to include abortion and the persistent and growing dissolution of the traditional family. But that is mere quibbling, given that those are but two of numerous factors, including those cited by Drum. that lead exposure is linked to production of the brain's white matter—primarily a substance called myelin, which forms an insulating sheath around the connections between neurons. Lead exposure degrades both the formation and structure of myelin, and when this happens, says Kim Dietrich, one of the leaders of the imaging studies, "neurons are not communicating effectively." Put simply, the network connections within the brain become both slower and less coordinated. found that high exposure to lead during childhood was linked to a permanent loss of gray matter in the prefrontal cortex—a part of the brain associated with aggression control as well as what psychologists call "executive functions": emotional regulation, impulse control, attention, verbal reasoning, and mental flexibility. One way to understand this, says Kim Cecil, another member of the Cincinnati team, is that lead affects precisely the areas of the brain "that make us most human." The scourge of violent crime has abated since the early 1990s. Violent crime had continued to rise through the decades until 15-20 years after environmental regulations and introduction of the catalytic converter led to a dramatic decline in use of leaded gasoline in the U.S.A. States which experienced the greatest decline in lead consumption enjoyed the greatest drop in crime while countries which least reduced lead ingestion( in which lead poisoning had been rare) experienced a minimal reduction. Crime rates in neighborhoods in American cities tracked closely with lead concentrations and elevated childhood lead levels were associated with a higher incidence of arrest in children followed from womb to adulthood. What science explained, experience confirmed. The evidence was overwhelming. African-American boys disproportionately involved in the criminal justice system were also disproportionately exposed to lead contaminated dust as young children, because black children were disproportionately concentrated in large cities and older housing. In 1976-1980, 15.3% of black children under the age of three had blood lead above 30 mcg/dl (micrograms of lead per deciliter of blood), when just 2.5% of white children had blood lead that high. In 1988-1991, after the elimination of leaded gasoline, 1.4% of black children and 0.4% of white children under the age of three had blood lead above 25 mcg/dl. "The change," Nevin found, "is not explained by changes in the African-American family, poverty, or rising incarceration," which shifted far less in the period studied. According to a 2009 study, “For every dollar spent on controlling lead hazards, $17–$221 would be returned in health benefits, increased IQ, higher lifetime earnings, tax revenue, reduced spending on special education, and reduced criminal activity.” Using the most conservative estimate of $17 in benefits for every dollar invested, the $6 million that sequestration already cut from lead removal programs will cost our country at least $102 million. The House Republican cut of $64 million below sequestration would cost over $1 billion. Clearly Repub congressional leadership is not aware of those consequences. If it were, thelead abatement program might have been completely eliminated.